Above: all the gears from a single Epson printer-scanner-copier. Most unmarked, but probably polyoxymethylene (POM). While the shredder and oven work is halted I decided to keep myself busy for a couple days by disassembling some machines from the trash. At hand were an Epson printer-scanner-copier probably purchased at Target less than five years ago and a Bissel vacuum which looked about 15 years old. With three screwdrivers and a little TV I ripped apart these two objects which people in my development had thrown out this year. I noticed that most parts were labeled for recycling, but some oddly weren't. 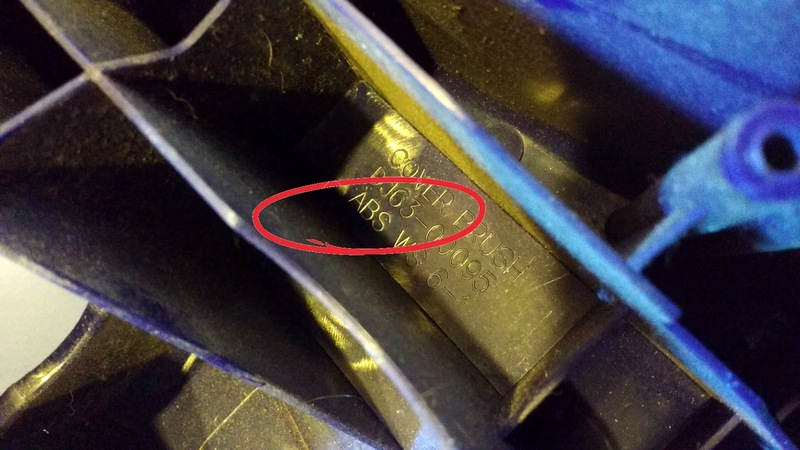 Here are some examples of ABS plastics I got out of the pile, and photos of the identifying markings. First up and one of the largest pieces off the vacuum was this blue brush cover. 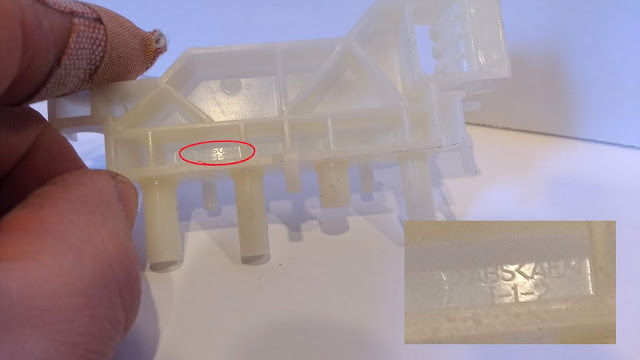 The complex stiffening ribs underneath make it hard to find information, but stuffed into one of the holes is the marker "ABS". Next, a part of the printer. This used to hold long, thin rollers, probably to move paper. 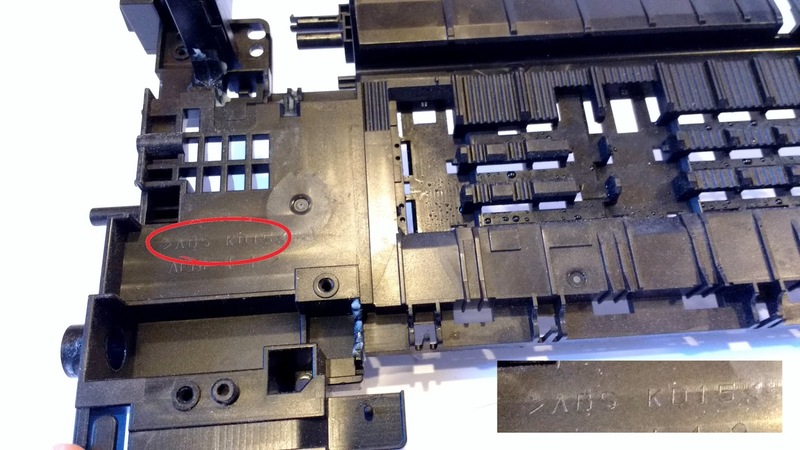 The marking here is quite obvious, and helpfully uses greater than and less than symbols to denote the plastic type. This specific one is marked >ABS KD15<. I do know that it's ABS, but the KD15 is a puzzle. I've Googled it but found no relevant results. It's probably ABS with an additive, and that additive probably isn't a toxic Brominated Flame Retardant (BFR). It may be something else toxic, but I can't find an MSDS so really have no clue. Another smaller piece is natural colored ABS. The type is small but legible. The printer actually had three different colors of ABS, this one being grey. I wonder why the material marker is so small when there are obviously quite large areas to potentially locate it. At about 11" (28 cm) long, there's enough real estate. 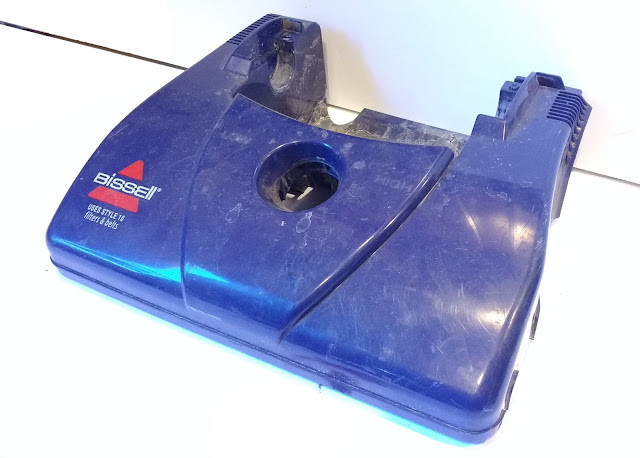 Next up was the Bissel's dust collector. This consisted of several pieces stacked on top of each other. Some pieces were ABS, like this one. Others were polypropylene. The bottom piece, though, is a mystery. It certainly appears to be made of the same material as the one above. But markings are elusive. 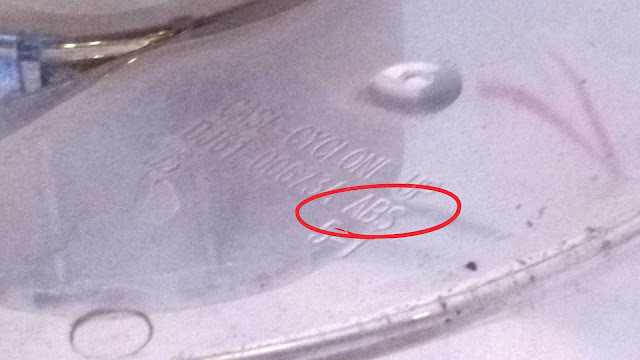 I would assume it's ABS just like the other, but I can't afford to contaminate a bucket of ABS if it isn't. This is why it's important to mark every piece, especially pieces this large. 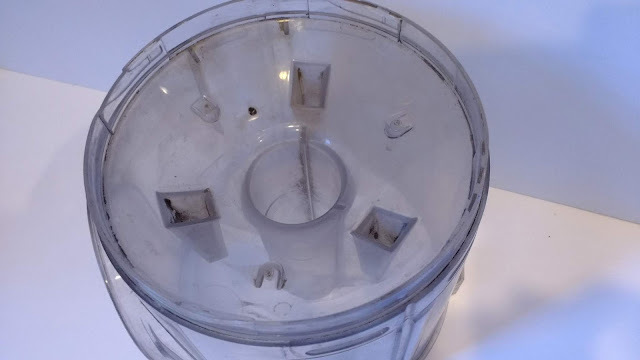 If and when take-apart culture is more widespread, these markings will be the difference between something being turned into something else, and being sent to the landfill. PC- Polycarbonate, I assume. 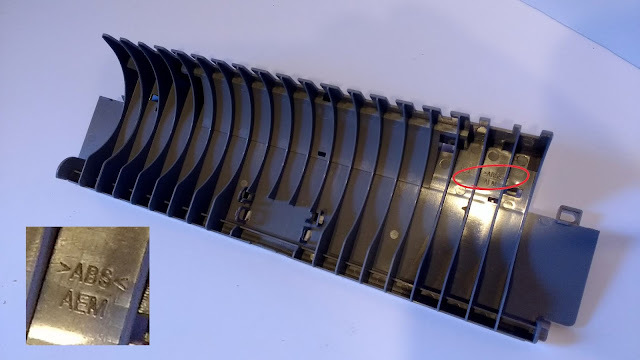 Scanner light housing. The only piece of PC in the entire product. Didn't collect enough to be worth recycling it. PP-FR- Polypropylene- Fire Resistant. 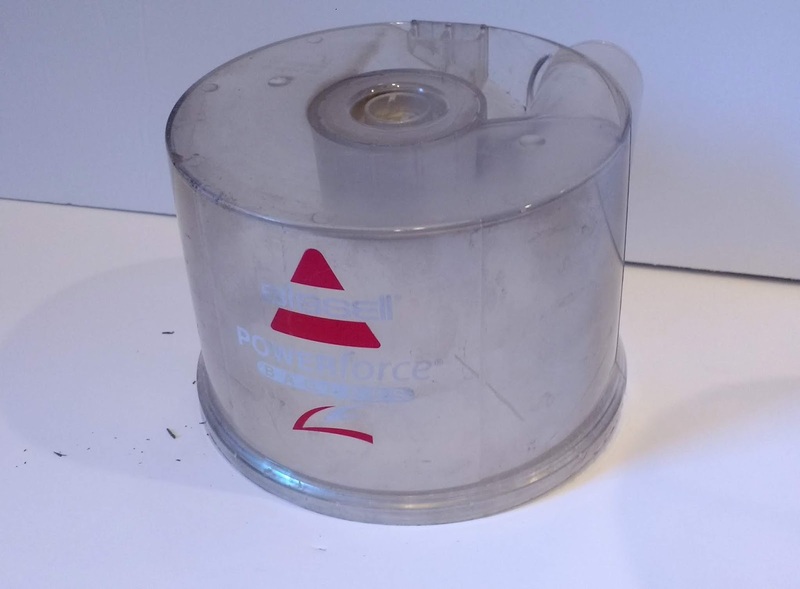 Printer power supply box. Likely toxic. Trash. PP-ND- Polypropylene ??. No idea what this means, and I don't remember what it was on. PS-HI (aka HIPS)- Polystyrene- High Impact. Most larger printer parts. 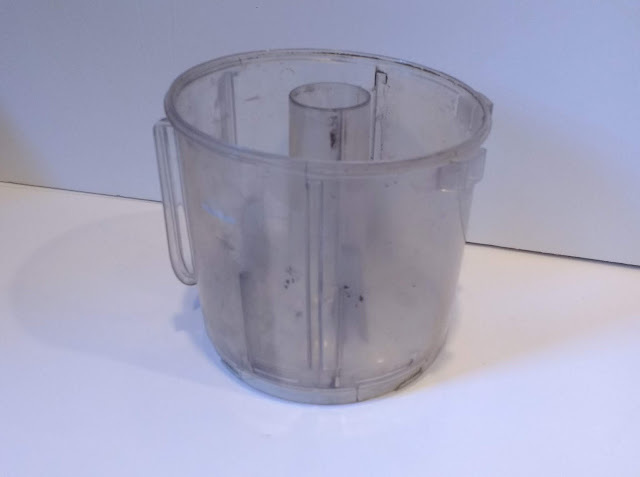 A combination of brittle PS and durable polybutadiene rubberizer, it's apparently used for many consumer products. I did find an MSDS for this and it is not listed as a possible or probable human carcinogen. Good news. I'm excited to see if this will work well for my shredder. POM- Polyoxymethylene. 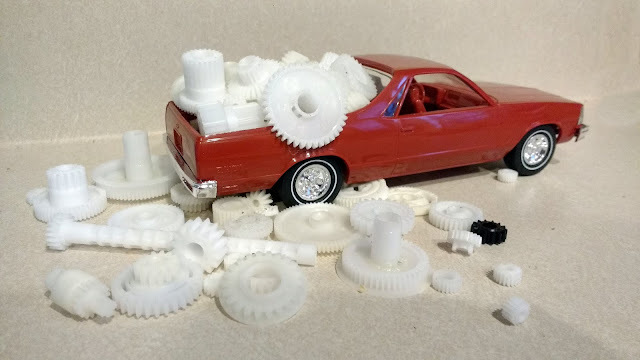 Natural colored gears and small parts in printer. This was a mystery to me until I looked it up. It's a high-precision, low friction plastic with good dimensional stability. I believe that means it doesn't heat and shrink much. Most gears are not marked >POM<, but just like soda bottle caps it's just about a foregone conclusion so I'm going to go with it. I'm also excited to experiment with this one but will need many more gears to be able to make anything. So far that's it for the deconstruction. I sent out a couple calls for plastic and machine donations. A few people have offered more printers and vacuums. The vacuums could be a pretty good source of ABS and large PP pieces. Wait 'n' see, I guess!